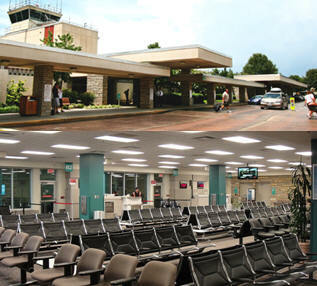 March 11, 2011 - The U.S. Department of Transportation’s Federal Aviation Administration (FAA) on Thursday celebrated the completion of terminal improvements at North Carolina’s Asheville Regional Airport, paid for with $7.8 million in American Recovery and Reinvestment Act funds. “Investing in our nation’s airports provides an important avenue for economic growth and helps us compete in the global economy,” said U.S. Transportation Secretary Ray LaHood. The $7.8 million grant paid for improvements to Terminal “A,” including departure gates, the security checkpoint and replacement of two passenger boarding bridges. The funding became available because other Recovery Act-funded airport projects came in under budget. “Upgrading infrastructure at airports such as Asheville Regional is an important use of Recovery Act dollars, which are helping to improve airport operations locally and across the United States,” said FAA Administrator Randy Babbitt. The American Recovery and Reinvestment Act of 2009, abbreviated ARRA (Pub.L. 111-5) and commonly referred to as the Stimulus or The Recovery Act, is an economic stimulus package enacted by the 111th United States Congress in February 2009. The stimulus was intended to create jobs and promote investment and consumer spending during the recession. The rationale for the stimulus comes out of the Keynesian economic tradition that argues that government budget deficits should be used to cover the output gap created by the drop in consumer spending during a recession. The modern consensus (a blend of thinking from New Keynesian and New Neo-classical theory in economics) favors monetary over fiscal policy like the fiscal stimulus. However, the Federal Reserve had already cut interest rates to zero, greatly reducing their policy options. The flow of finances was stagnated because of a liquidity trap, or an over leveraged/broke banking system, also limiting monetary policy effectiveness. While many economists agreed a fiscal stimulus was needed under these conditions, others maintained that fiscal policy would not work because government debt would use up savings that would otherwise go to investments, what economists call crowding out. Proponents countered that the negative effects of crowding out are limited when investment has already stagnated. The Act includes federal tax incentives, expansion of unemployment benefits and other social welfare provisions, and domestic spending in education, health care, and infrastructure, including the energy sector. No Republicans in the House and only three Republican Senators voted for the bill. The bill was signed into law on February 17 by President Barack Obama at an economic forum he was hosting in Denver, Colorado. As of the end of August 2009, 19% of the stimulus had been outlaid or gone to American taxpayers or businesses in the form of tax incentives.